When leaks occur they often generate an ultrasonic frequency that is beyond human hearing. 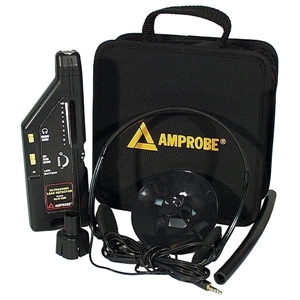 Amprobe's ULD-300 converts these sounds into an audible range for easy detection. The ULD-300 detector tests pressurized air lines, refrigeration systems and steam lines for leaks. Leak locations can be quickly and easily located with the ULD-300. Also useful in locating electrical arcs and in finding the ends of buried PVC pipes.